Man! Talking about ‘accentuating the positive!” There is nothing negative about our next feature! She’s a woman with raw talent, and a woman who has a penchant for soulful tunes. She is also the first female Vocalist to be featured at LivingTru.com, and she is definitely a young woman who understands the purpose of music and how to utilize it, in such a way, that makes people stop and take notice. 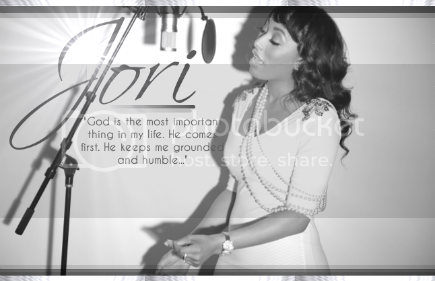 Come with us as we showcase the genuinely humble, and remarkably talented, Ms. Jori. The first and obvious question Jori is, how long have you been singing? What artist's do you listen to and how do they influence you? Well I have been singing since I was 9-years-old. I was singing to myself during recess and one of my peers overheard me and said that I could sing. The rest is history! As far as the artist's that I listen to... they range from Beethoven to Beyonce. But, I am influenced more by the older generation. I love the rifts and runs of their vocal style. I know what you mean. I grew up on "old school" music, and I love it! Your vocals are very strong, forceful even, and you exemplify such power when you sing. Is this something you've always done, or have you had formal training? I've had about a year worth of training with world renowned vocal coach, Robin Brown. I definitely noticed the difference in power and control after she taught me the proper breathing techniques. Yeah, it shows in your music! Your breath control is on point and I love the style you bring to each song, where do you think all of that energy comes from? I think the energy comes from within. When I'm on stage I feel completely free. It is a euphoric feeling. I can imagine that! Its probably close to the way I feel each time I feature a new talent! Lol! Do you come from a musical family, do you have siblings who sing, and do you have any plans to record a mixtape, or CD? I come from a family of singers. My grandfather was in a Doo-Wop group back in the day. My uncle, who sings, had a huge impact on me wanting to sing. When I was younger he was pursuing his musical career, so I spent many days going to his performances and video shoots. My two younger sisters also sing. Right now I am in the studio writing and recording original songs; I plan to release a single on itunes. That's cool! Being a Songwriter and Vocalist has to be rewarding, because not only are you writing the songs, but you sing them too, which means that you can project what you really feel from within. And, it gives insight into the artists' psyche! I believe your voice will definitely appeal to the masses, and LivingTru.com likes the idea of being just one of the vehicles used to take you where you wanna go!Lol! What would you do to help someone in their career endeavors, (any career)? One of the things that I look forward to doing in the future is helping kids like me get prepared for the music industry. I can do this by providing them with the tools and knowledge they will need, and by opening a school that caters to performance careers in the "mainstream" music industry. I feel like it's something that's missing from the world, simply because there are many formal music schools, but none that would have really prepared people like me for what I want to do. Very well said! And its great to see another young person interested in the direction of younger people, and having the wherewithal to help them! I love kids and I believe they need all the help we can give them as long as its steering them in a positive direction, lol! Where do you see yourself 5 years from now? Well, success is a really cool vision, and may we all get there and remember to help those who are less fortunate along the way! Smile. Are you ever nervous about performing, and what frame of mind do you have to be in before singing? I always get butterflies before I go on stage because waiting to perform is so nerve racking to me. I always try to relax/chill and think about the words to the songs I'm going to sing. Keeping in mind, that I am telling the audience a story. I've either heard or read many Artists say the same thing with regards to being nervous before performing! Its kinda funny to hear that especially if the artist has mad vocals, lol! I have just a few more questions. What role does religion or spirituality play in your life, and if there is one thing you could do to make this world a better place, what would it be? God is the most important thing in my life. He comes first. He keeps me grounded and humble. If there is one thing I could do to make the world a better place, it would be to make everyone genuinely love each other. I know that sounds corny, but I feel like if we all loved one another then the world would be a million times better. Wow! That's not corny at all! Its a shame that simple things can keep us divided when we should be more unified as a society. What venues have you performed in, and who's your greatest supporter? I've performed in venues all over Atlanta, The Apache Cafe, The CW and The Atrium just to name a few!. My greatest supporter or supporters would have to be my mother and father. They support my dreams by coming to every single one of my shows. They provide everything I need for my career; from wardrobe to studio equipment. It's great having someone believe in you, whether its a parent, or a person in your community! My mom supports me too, and I am very grateful for that! Okay, this is the last question, lol! How do you channel your "positive energy?" I channel my positive energy through music itself; I use all my bottled up emotions to fuel the songs that I write, then I release it all when I perform them. Lol. I enjoyed answering the questions! LOL! I enjoyed having you! Thank you so much! Alright LivingTru readers, you know what to do! Be sure to connect with Jori on all of her social networks, and check out her video below! Wow, she's beautiful and can sang! Go head Ms. Jori, do yo thang!!! Love you Jori !! Keep singing!!! You are wonderful; exactly what the industry needs now!! Love you Jori!! Keep doing your thing!! Unbelievable Voice! Jori is a very talented lady! This young lady is a GREAT TALENT! Why is she still unsigned? Love you Jori! Success is around the corner!